As previously stated, the first step in a quality ESD control program is grounding your personnel. People walking in a facility and performing common tasks generate a static charge. If not grounded, the voltage accumulated through this charging may be transferred to your product and can cause significant or catastrophic damage to electronic devices. The most common method for grounding people handling electronics is by using a wrist strap and coil cord. 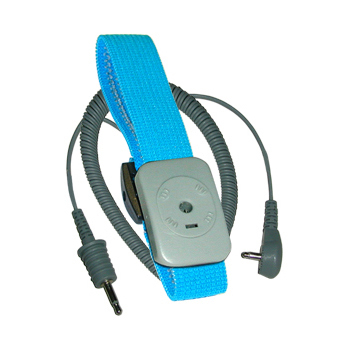 The wrist strap and cord transfer any voltage from the person to ground. When a wrist strap system is functioning correctly and worn properly, it is extremely difficult to accumulate more than a few volts on a person, which, in all but the most extreme cases, is not enough to cause damage to devices. Wrist strap systems should be tested on a regular basis. If the wrist strap system is malfunctioning or worn improperly, the voltage may continue to grow and accumulate to levels that can damage most electronic devices. Therefore, it is very important that the wrist strap system be tested on a regular basis to assure that it is functioning properly. There are a number of ways that the wrist strap system can be tested, and the best method depends on the number of employees in the facility, the critical nature of the product (i.e., medical, aerospace, military, high value), and budget. Test Frequency: How often the person goes to the test station varies between companies. Some companies require testing at the beginning of each shift while others test every time the person leaves the work station for breaks. In each case, should the test indicate a failure of the wrist strap, there leaves a question as to when the failure occurred and how much product was handled with the failed strap. For high reliability and value products the customers of this company may want to know the disposition of the product that was handled during the time between tests. False Security: When testing a wrist strap at a test station, only the wrist strap, cord, and person are tested at that precise moment. The situation could change once the operator reaches the work station. The operator could adjust the strap after testing, the resistance could increase due to dry skin conditions, or the ground jack at the work station could malfunction. All of these scenarios could lead to high voltage accumulation on the operator that would not be detected by the tester. Wasted Time: Depending on the size of the company, there can be a line at the test station of employees waiting to test their wrist straps, effectively delaying the time they spend on productive activities. Record Keeping: Most companies require their people to sign-in at the tester and record the results. There are some systems that automatically record and store the results after the employee has swiped their ID badge. Someone in the company still must maintain and review the test records to assure that everything is working as designed, which can be tedious and time-consuming. To address these drawbacks, many companies are now using continuous monitoring to verify that the wrist straps are functioning correctly. Continuous monitors are located at the work station and provide an audible and visual indication when the wrist strap system malfunctions. Once the operator hears the alarm they do not touch the product until the problem is resolved and the system is functioning correctly. With continuous monitoring systems, you avoid waiting in line for testers, eliminate the extensive record keeping, and you remove doubt that the product may have been handled by an ungrounded operator. There are no more decisions to be made on what to do with product that was handled by ungrounded operators, as there is no longer any time between tests. There are a few options available today for continuous monitoring. Some monitors will simply verify the operator wrist strap, while others will verify the wrist strap, the work surface ground, and possibly other equipment grounds. Some continuous monitors use capacitance or impedance to verify that the operator is connected to the system. These systems allow the company to use the standard single-wire wrist strap and coil cord system and are typically the lowest cost option for continuous monitoring. These monitors operate by using a capacitance or impedance circuit to estimate the resistance of the operator wearing the wrist strap. Since the system is not making an actual resistance measurement, these systems can sometimes be fooled by high skin resistance of the operator and may provide false passes. Dual conductor resistance monitors use a special wrist strap and coil cord to incorporate the operator in a resistance measurement. Instead of the single conductor wire found on standard wrist straps, this monitor uses a dual-wire coil cord and a wrist strap that has two isolated halves. A voltage is sent down one of the wires and into the wrist strap. When the person is wearing the wrist strap properly, their skin completes the circuit and the signal returns down the second wire to the monitor. This system assures that the operator is electrically connected to ground. Many companies are now using continuous monitors like Transforming Technologies Ranger Series. While dual conductor resistance monitors provide the most reliability, they also typically have the highest cost and require special wrist straps. A new series of dual-wire resistance monitors (from Transforming Technologies) are priced closer to the single-wire systems, but provide the reliability of dual wire. The CM1601 Resistance Ranger provides dual wire monitoring for a single operator, and the CM1602 Dual-Wire Resistance Ranger monitors the operator and one work surface ground. Transforming Technologies also offers great options for dual-wire wrist straps and cords that provide both excellent quality and value. Thanks, Craig, for further educating us on how to develop and maintain a successful ESD control system. We look forward to your future Guest Blogs. For information about Transforming Technologies and their ESD control/monitoring products, please visit QSource.com. You may also contact us via email or phone at 800-966-6020 and one of our associates will be happy to assist you. If there's a product or topic you'd like to see The Q Source Resource write about please let us know. We'd also appreciate if you share this blog post with your friends and colleagues via the social media links below. If you have questions or comments for Craig about this, or any of his Guest Blogs, please leave him a message in the comments section.